I took this picture this morning in our office here at home. Does it look blurry to you? 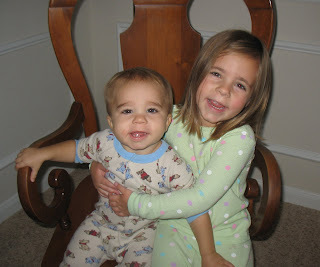 I finally captured a picture of the kiddos touching one another and both are smiling somewhat decently. The problem is that I grabbed the first camera I could find and it didn't take a good quality picture. Bummer?!?! I love seeing the kiddos in winter pj's after not seeing them in long sleeves and pants since March. Layla was so excited that I got her warm pj's out. She was running around acting silly this morning, and he followed suit! They were hooting & hollering...tee hee! A few nights we have needed the warm pj's, but all in all they have been sticky and warm. This weekend we are supposed to have awesome fall weather. Highs in the 70's lows at night around 45 degrees. I am STOKED!! We had a few days of fall weather and now it's back in the 80s! I'm ready for fall to get here...manly because Charlie has outgrown all his summer clothes! We have been able to have our doors open all day and no AC kicking on...awesome!! i think it's a cute picture, I don't think it looks too blurry. I am so wanting some of that cooler weather, it sounds like we might get some this weekend!! YAY!! I KNOW! Aren't you loving it?!! I walked outside this morning and was soooo stoked to feel a chilly breeze! Gotta love Dallas in October!